Hop aboard a raft, rely on the team work of a group of people you may never have met before, throw yourself down gushing river water features with names like “The Roller Coaster” or “The Waterfall” and see if the adrenalin doesn’t start to rush! 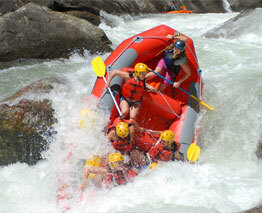 The rivers of the Bay of Plenty interior offer an amazing array of multi-grade white water rafting experiences and a number of operators run tours throughout the area. Said to be the “ultimate adrenalin buzz in the Bay”, Tauranga offers tandem sky dives out of Tauranga Airport. If throwing yourself out of a plane sounds like the experience of a life time, make sure you do it in the Bay of Plenty! A little more sedate, but no less exciting, balloon travel can be an amazing experience. Katikati has its own hot air balloon company operating mostly over the Waikato. They offer one hour flights and champagne style breakfasts. Perfect for any age, Papamoa’s Blokart Landsailing is land based racing with a sail. Low weight and a reasonable top speed over short distances means Blokart Landsailing is exciting, action packed and a speed thrill. Papamoa Adventure Park: history, tradition and the ultimate downhill thrill on the world’s first dirt track luge. Horse Trekking: Head for the hills on horseback. 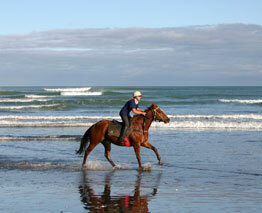 The Bay of Plenty boasts numerous well-established horse trek operators running tours through bush and coastal environments. Adventure Parks: Te Puke and other areas operate adventure parks, some with scenic jet boating on the Kaituna River including 360 degree jet spins, clay bird shooting, 4WD adventures, self-drive Hill Hoppers, farm and orchard tours. Helicopter and Plane Tours: Take a stunning, scenic tour by plane or helicopter over the Bay of Plenty’s sparkling ocean and immense native bush or journey to White Island in style. A beautiful region to be seen from above. Tauranga Gliding Club: Try your hand at gliding, see the world from above in total peace and quiet. Operates out of Tauranga Airport.